Muslims in America experienced a big increase in hate crimes in 2016, the year they were made scapegoats in an extremely polarizing presidential campaign in the U.S., according to new FBI data released Monday. The data suggest that hate crimes against Muslims increased more than 26 percent in 2016 to 381 offenses, according to the FBI. It’s the second consecutive year of increases; in 2015, hate crimes increased nearly 70 percent from the prior year. 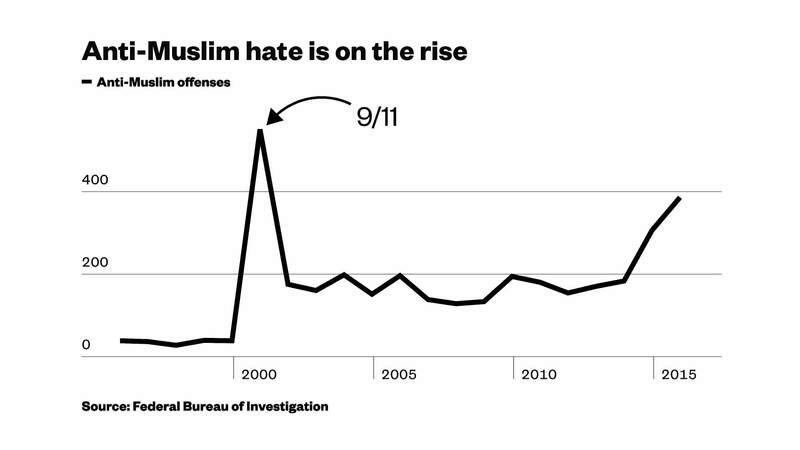 Reported hate crimes against Muslims in the U.S. are at the highest level since 9/11. “Last year’s national increase was driven by above-average increases in large jurisdictions and a precipitous election-time spike,” said Brian Levin, who heads the Center for the Study of Hate & Extremism at California State University, San Bernardino. The increase in anti-Muslim incidents reported by the FBI is consistent with unofficial tracking systems operated by groups like the Council for American-Islamic Relations, the Anti-Defamation League, and the Southern Poverty Law Center. Those groups watched with alarm how a series of ISIS-inspired attacks at home and abroad fueled anti-Muslim rhetoric on the campaign trail, saying that President Donald Trump’s victory emboldened people to express Islamophobia and other forms of hate in the U.S.
What’s perhaps more alarming than the increase in anti-Muslim incidents themselves, is that violent hate crimes are rising faster. For example, in 2014, 13 percent of anti-Muslim incidents involved an aggravated assault. Whereas in 2016, 17 percent (52 in total) of anti-Muslim hate crimes involved aggravated assault, according to Southern Poverty Law Center researcher Alejandro Beutel. The FBI figures are far from conclusive because the agency depends on reports from local law enforcement agencies, some of which don’t report hate crimes at all. Of nearly 18,000 law enforcement agencies in the U.S., only 15,254 agencies submitted hate crime data for 2016. What’s more, reporting standards vary between agencies. Jurisdictions with robust reporting systems in place may reflect a far higher hate-crime incidence rate than those with poor reporting systems. A study by the Department of Justice released earlier this year found that only around 40 percent of hate crime victims actually file reports with officials. Former FBI Director James Comey was vocal about the need for the FBI to track hate crimes more vigorously. As flawed as these numbers are, they still give a directional sense of what’s happening in the country. And the picture they’re painting is not good. Overall, the FBI says, hate crimes are up 4.6 percent across the board in 2016, marking the first back-to-back annual increases in hate crimes since 2004. Muslims aren’t the only group seeing more hate crime. There were 334 anti-Latino incidents in 2016, a 12 percent increase from the previous year. The FBI’s dataset also shows an increase in anti-white crime: 720 incidents in 2016, compared to 613 the previous year. The Jewish community also faced more bias and hate crimes in 2016, reversing a five-year downward trend. Increased violence against the Jewish community has also been observed anecdotally. For example, there was a rash of Jewish cemetery desecrations and bomb threats in the weeks following Trump’s inauguration in January.